Click on any of the products below to find out more information. If you have questions regarding any of our products, or would like to place a customized order, give us a call to discuss your specific needs. Tubular Elements are the most versatile, dependable and rugged of any heat generation device. These qualities make it an ideal heat source for many applications. ASB uses precision wound 80-20 nickel-chrome wire to deliver an even heat distribution to the element sheath. High purity, grade A magnesium oxide is used as the internal insulation to insure the best thermal transfer and insulation resistance. 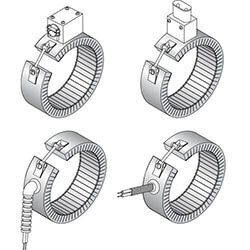 A variety of electrical terminations, mounting fittings and brackets, along with the wide array of bending options, allow for easy integration into any heating system. Both Finned and un-Finned tubular elements can be bent to one of our many standard configurations. We can also bend to your specifications. ASB specializes in bending complex manifold/mould heaters from customer supplied drawings. 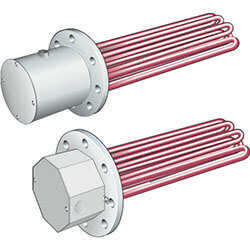 Finned Tubular Heaters are used for heating air and other gases. We offer a standard carbon steel construction and a high temperature/ corrosion resistant stainless steel construction. As with regular tubular elements, they can be bent to a number of shapes and are available with fittings and mounting brackets as required. Sheath and fin material are mild steel. Stainless steel sheath and fin material is available. 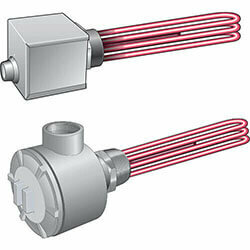 Welded and Brazed Fittings are supplied for heaters immersed in liquids. Crimped-On fittings are typically used for air or gas applications. Fittings are offered in Brass, Steel and Stainless Steel. Custom fittings are available and are subject to quantity minimums. Mounting Brackets are available in a variety of materials, sizes and configurations. They can be supplied with or without gaskets. These are typically custom made to match your mounting requirements, but we do offer some standard designs. Screw Plug Heaters are constructed by brazing or welding elements into a hex pipe thread. These are intended for direct immersion into fluids and gases. 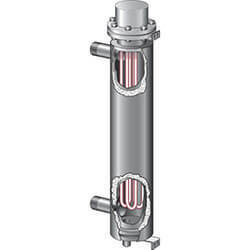 The heater is to be installed via a threaded port in the tank or vessel. Screw plug heaters are available in a variety of pipe thread sizes and materials. The heating elements are offered in a number of materials suited to a variety of fluid heating applications. Terminal housings are available for indoor, outdoor (weather- proof NEMA 4) and hazardous (NEMA 7) environments. Many options are available including thermostats, high limit and process thermocouples or RTD sensors. Since we are a made to order company, we can offer a large selection of sizes and configurations which are not listed below. Please contact us for assistance with your application. 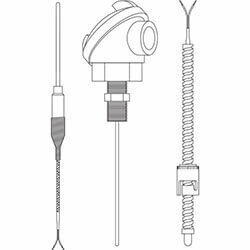 NPT Sizes 1", 1 1/4", 1 1/2", 2", 2 1/2"
British Sizes- BSP, BSPP 1", 1 1/4", 1 1/2", 2", 2 1/2"
"K" calibration thermocouple for high limit sheath protection and fluid sensing and temperature control. "J" calibration thermocouple for high limit sheath protection and fluid sensing and temperature control. 100 Ohm RTD Sensor for fluid sensing and temperature control. 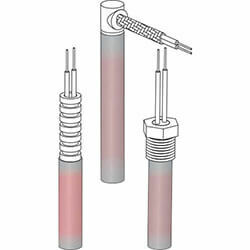 Flange Immersion Heaters are constructed by brazing or welding elements into an ANSI or plate flange. These are intended for direct immersion into fluids and gases. The heater is to be installed via a flanged port in the tank or vessel. 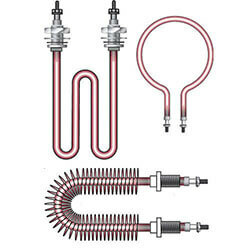 Flanged Immersion heaters are available in a variety of flange sizes and materials. The heating elements are offered in a number of materials suited to a variety of fluid heating applications. Terminal housings are available for indoor, outdoor (weather- proof NEMA 4) and hazardous (NEMA 7) environments. Many options are available including thermostats, high limit and process thermocouples or RTD sensors. Since we are a made to order company, we can offer a large selection of sizes and configurations which are not listed below. Please contact us for assistance with your application. ANSI Flange Sizes 2" through 24"
Since the thermostat will be located inside the pipe, it will be measuring the internal pipe temperature. The thermostat is intended for high limit purposes and is not suitable for process control. "K" calibration thermocouple for high limit sheath protection. Since the thermocouple will be located inside the pipe, it will be measuring the internal pipe temperature. The thermostat is intended for high limit purposes and is not suitable for process control. Screw plug (SPA Series) and Flanged assemblies are available complete with a pipe when installation of a pipe into the tank is not feasible or desirable. The pipe wells are 2" or 21/2" NPT schedule 40 carbon steel in the standard designs. Stainless steel pipes and connection fittings are available for chemical corrosion for or immersion into food products. Over the Side Heaters are used in applications where drilling a hole into the tank wall is not possible or desirable. The heater can be installed resting at the bottom of the tank or hanging from the lip. Over the side heaters are available in a variety of sizes, materials. and configurations The heating elements are offered in a number of materials suited to a variety of fluid heating applications. Terminal housings are available for indoor, outdoor (weather-proof NEMA 4) and explosive (NEMA 7) environments. Many options are available including thermostats, high limit and process thermocouples or RTD sensors. Since we are a made to order company, we can offer a large selection of sizes and configurations which are not listed below. Please contact us for assistance with your application. NEMA 4 (weather proof) terminal housings are standard on all units. NEMA 4X (moisture and corrosion) and NEMA 7 (hazardous) are available. "K" calibration thermocouple for high limit sheath protection and air sensing and temperature control. 100 Ohm RTD Sensor for air sensing and temperature control. Circulation Heaters consist of an insulated pipe body containing a Screw Plug Heater or Flanged Immersion Heater assembly. They are designed to heat moving air, gases or liquids through the vessel in a single pass or re-circulating, multi-pass system. These units can be mounted horizontally or vertically and are available with a variety of pipe thread and flanged inlet and outlet options. Terminal housings are available for indoor, outdoor (weather-proof NEMA 4) and hazardous (NEMA 7) environments. Many options are available including thermostats, high limit and process thermocouples or RTD sensors. ASB Heating Elements has been manufacturing formed tubular heaters for hot runner systems for many years. Our skilled benders and specialized bending equipment allow us to bend complex shapes directly from Autocad drawings. We do not require wood patterns or the actual mould for the manufacturing of these units. We count many of the top mold makers in the USA and Canada as customers for these heaters. Our formed mould heaters and manifold heaters are made with our high quality Tubular Heating Elements. Please see this section for construction details and terminal options. Below is a small gallery of custom shapes we have done over the years to give you an idea of heaters that were bent strictly from customer supplied drawings. The construction of high temperature cartridge heaters positions a nickel-chrome resistance wire precision wound around a magnesium oxide core. It is inserted into a stainless or Incoloy tube locating the resistance wire close to the sheath. The core is centrally positioned within the tube and filled with magnesium oxide powder. Nickel pins pass through the centre of the core making contact with the resistance wire at both ends. The whole is assembly is highly compacted by a swaging operation and thus ensuring excellent heat transfer to the external sheath. This allows for operating temperatures to 1600ºF and high watt densities. One end of the heater is closed with a welded metal end-disc and wire leads exit at the opposite end which is typically closed with a lava seal. A variety of wire leads and lead protection options are available. Heaters can be supplied with internal thermocouples, mounting fittings and many other options. Cartridge Heaters can be designed with varying wattage densities along the length of the heater. This is common for sealing bars where increased heat is required at the ends. This option offers more or less heat where required to ensure even and uniform heating. Welded and Brazed Fittings are offered in Brass, Steel and Stainless Steel. They are available in single ended and dual ended constructions. These are suitable for immersion into liquids. Custom fittings are available and are subject to quantity minimums. Mounting Brackets are available in a variety of materials, sizes and configurations. They can be supplied with or without gaskets. These are typically custom made to match your mounting requirements, but we do offer some standard designs. A high temperature double crimp connects the MGT (450°C) leads to solid nickel pins. This construction is recommended for applications with elevated temperatures. Due to the rigid nickel pins, this construction is not recommended in applications where movement or flexing is encountered, or if sharp bends are required adjacent to the heater exit. High temperature MGT (450°C) wire is internally connected and swaged in place. This construction is recommended for applications in which the leads must be bent at the exit point from the heater and where mild flexing may be found. For applications with continuous or more severe movement, we would recommend metal braid or armor cable. High temperature MGT (450°C) wire is internally connected and swaged in place along with stainless steel braid. This construction offers protection against abrasion and sharp edges. This is a very strong construction which offers full length flexibility. This construction is recommended in applications with flexing and where the leads must pass through metal openings or routed along metal components. High temperature MGT (450°C) wire is internally connected and swaged in place along with stainless steel hose. This construction is recommended for applications in which the leads are subjected to abrasion or run the risk of being pinched. This is the strongest lead protection available and works well in moving or flexing applications. High temperature MGT (450°C) leads exiting at right angle to the sheath. This construction offers a compact design where space is limited. This construction is not recommended where abrasion or flexing is present. Stainless steel braid over high temperature MGT (450°C) wire exiting at right angle to the sheath. This construction is recommended in applications with flexing and where the leads must pass through metal openings or routed along metal components. This construction is desirable when space is limited and it is not feasible to bend standard leads. Stainless steel hose over high temperature MGT (450°C) wire exiting at right angle to the sheath. This is the strongest lead protection for use in applications where severe abrasion is present. 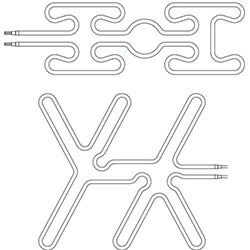 These leads offer good flexibility and are good for moving or flexing applications. 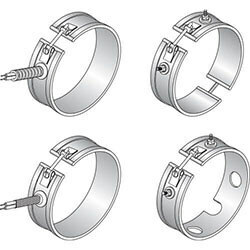 Single or double threaded fittings attached to sheath to allow for installation into threaded holes. 1/4" 1/8-27 3/8" 3/16" 1/4"
3/8" 1/4-18 1/2" 3/16" 1/4"
1/2" 3/8-18 9/16" 1/4" 1/4"
5/8" 1/2-14 5/8" 1/4" 5/16"
3/4" 3/4-14 3/4" 1/4" 3/8"
7/8" 1-111/2 3/4" 1/4" 3/8"
1" 1-111/2 3/4" 1/4" 3/8"
11/4" 11/4-111/2 7/8" 5/16" 1/2"
Mounting flanges are recommended for applications where vibration or movement may cause the heater to be dislodged from its hole. Stainless steel flanges are available in a variety of sizes and configurations. The standard flange is round and is supplied with two mounting holes. For heaters 5/8" diameter and under, the flange would be 1 1/2" in diameter. 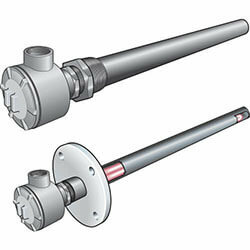 For larger diameter heaters the standard flange would be 2.00" in diameter. A Teflon plug is swaged in place along with Teflon leads. This construction resists oil and water to 250°C/480°F. There is a minimum of a 1.00" unheated length at the lead end. Longer cold sections may be required if the watt density or operating temperature is high. Threaded stud terminals are supplied complete with high temperature nuts and washers. Standard screw is #8-32. Available in 5/8", 3/4", 1", 16 mm and 20mm diameters heaters. These terminations are ideal for applications where wiring form both ends is required. A minimum cold section of 1" is required for these leads. Terminal boxes are permanently attached to the heater sheath to provide excellent protection in a variety of environments. Internal thermocouples are built into the heater assembly to monitor the internal or sheath temperatures. These are useful as high limit devices or in applications where space is at a premium. The power and sensor leads exit the sheath together and can be ordered with a variety of lead protections. Not all thermocouple configurations are available on smaller diameter heaters. Type J and K calibrations are standard for the shown constructions. The thermocouple junction is grounded to the disc end of the heater. This construction is commonly used in hot runner applications. The disc end can be filled with silver solder and ground flat. This will ensure good contact when inserted into a flat end blind hole. The thermocouple junction is ungrounded and is located just behind the disc end. This will give a reference temperature of the part being heated. The thermocouple junction is grounded to the sheath along the length of the heater. The standard location is at the center of the heater, but can be located anywhere along the length of the sheath. This construction will provide a quick response. The thermocouple junction is ungrounded and is centered in the diameter of the sheath. The standard location is at the center of the heater, but can be located anywhere along the length of the sheath. Typically used as a high limit in air or vacuum applications. Infrared radiant energy is transferred through space by electromagnetic waves. It does not require the use of a conductive media; in other words, energy is directly carried from the heater to the product without the need for contact or a medium such as air. All the heaters in this section fall into the medium wave spectrum. This wavelength is absorbed very efficiently by plastics and water based products. This makes the heaters ideal for drying and curing paints, melting plastics and heating food products. 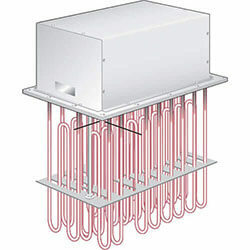 Radiant Heaters are used for spot heating, continuous web heating, and indexing systems. From a small to a large installation, ASB Heating Elements Ltd. has the expertise to help you size the project and advise on the correct installation and control system required. For applications where fast heater response required for heat sensitive products or webs. Black Glass (shown)1350°F (2.0 micron peak) CV series Opaque Glass (not shown)1600°F (2.5 micron peak). Highly efficient long and medium wavelength infrared, heats all colours equally well, except pigments containing carbon black, which have higher absorption rates. For applications where ultra fast heater response required extremely uniform heat pattern for sensitive products or webs. High Density Strip Heaters are constructed with a highly compacted refractory insulation that quickly conducts heat from the resistance wire to the sheath resulting in low internal temperatures and long heater life in the most demanding applications. Precise placement of the resistance wire provides uniform sheath temperature across the width and along the entire heated length. HD strip heaters are 3/8" thick and provide a rigid sheath for secure clamping to flat surfaces. There are three terminal options to allow for easy installation wiring. This is an extremely rugged construction capable of high temperatures and high watt densities. Finned HD Strip Heaters feature the same highly compressed, rugged design as HD Strip Heaters with the addition of 13/8" ×2" fins. Fins increase the heat transfer surface area to allow higher wattages than standard HD Strip Heaters. Rust resisting iron sheath items (HDA) are standard with aluminized steel fins. Stainless steel sheath items (HDS) are standard with stainless steel fins. These are intended to be operated with a substantial airflow and are typically used in heating tunnels, dryers, or any application that requires a hot air source. Mica Strip Heaters are constructed by winding a nickel-chrome resistance ribbon around mica insulation and encapsulated in a stainless steel sheath. They are available in an extensive variety of sizes and shapes with options for holes, notches and cut-outs. A number of threaded terminals, wire lead options and terminal boxes offer great flexibility for field wiring. With temperature capabilities of up to 900°F, these heaters are ideal for plastic processing applications and for anywhere heat is needed on a flat or curved surface. 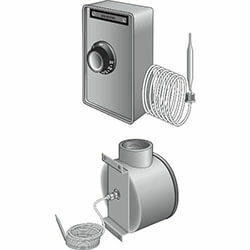 Mica Band Heaters are constructed by winding a nickel-chrome resistance ribbon around mica insulation and encapsulated in a stainless steel sheath. It is then formed to the desired diameter for installation over a dies, barrels and nozzles. They are available in an extensive variety of sizes and shapes with options for holes, notches and cut-outs. A number of threaded terminals, wire lead options and terminal boxes offer great flexibility for field wiring. With temperature capabilities of up to 900°F, these heaters are ideal for plastic processing applications and for anywhere heat is needed on a round or curved surface . To be used when a heater can be slipped over a barrel without having to expand the heater extensively. 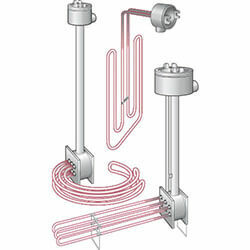 One-piece flexible heaters are used in applications where expanding the heater is necessary during installation and a multiple segment heater is not practical. These heaters should not be opened more than twice. Mica Heaters can be constructed in square or rectangular shapes if required. Other multi sided shapes are available. 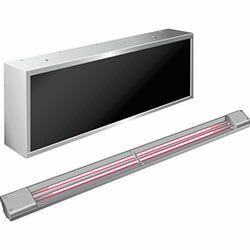 Band heaters can be constructed to cover only a portion of the barrel or die. These are used where large holes or obstructions prevent the heater from going around the part. — Ease of installation in difficult locations. Recommended for diameters larger than 15". Available with any termination or clamping styles. Built-in Strap — Barrel nuts provide secure and strong clamping. Also available in spring loaded designs for larger diameters. Expandable or Hinged — One piece construction used where heater cannot be slid over the barrel or die. Two sets of terminals required. All terminations available. Bent Up Flange — Available with any termination style and is only recommended for narrower designs. Holes and Cutouts — Allow for installation of thermo-couples and transducers and give clearance for mounting bolts. Separate Strap — Available in all sizes and configurations. Built-in straps are recommended wherever possible. Typically used in smaller diameters. Nozzle Style — Fiberglass leads 12" long is standard. Fiberglass Leads with Armor Cable — Specify location and length of leads at time of order. Nozzle Style — Fiberglass leads with metal over braid 12" long is standard. Fiberglass Leads with Metal Braid — Specify location and length of leads at time of order. Nozzle Style — Fiberglass Leads with Metal Braid - Exiting from the edge at 180 degrees from the gap. Fiberglass Leads with Protective Sleeve — Specify location and length of leads at time of order. 10-32 Threaded Terminals — Minimum width required 7/8"
Ceramic Terminal Covers — Available on all threaded terminals. Covers available separately. 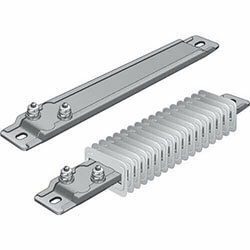 10-32 Threaded Terminals — Minimum width required 7/8" - Specify location at time of order. 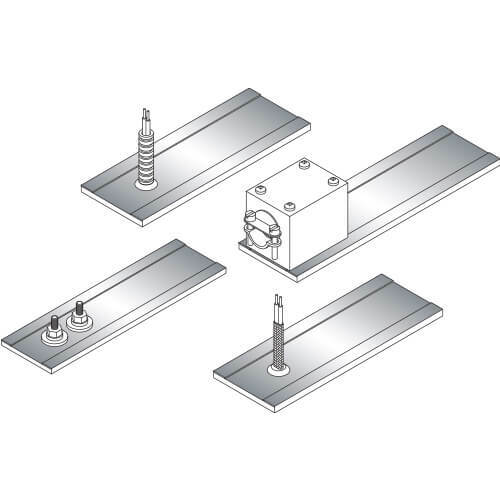 Sheet Metal Terminal Box — Available with T2 and T3 threaded terminals. 10-32 Threaded Terminals — Minimum width required 2.00" - Specify location at time of order. 90 Degree European Plug — Also available straight out - Specify location at time of order. Ceramic Band Heaters offer longer heater life, high processing temperature capabilities and full flexibility for ease of installation. The built in thermal insulation limits heat losses and conserves electrical energy. A wound nickel chrome resistance wire is strung through high temperature ceramic bricks that sit on an insulation blanket of ceramic fiber insulation. The insulation blanket will reduce heat losses by approximately 20% from un-insulated band heaters. Ceramic Band Heaters offer temperatures to 1400°F. This is all mounted into a stainless steel casing with serrated edges. This provides strength and great flexibility such that the heater can be fully opened for ease of installation. Ceramic Band Heaters transmit heat both through conduction and radiation. Due to this effect, the fit is not as critical as with other types of band heaters. These are available with a number of lead wire options, threaded terminals, terminal boxes and European plugs for electrical wiring. They can be made in a large variety of sizes, multiple segment and clamping styles. Flexible Construction can be opened to full diameter. Thickness with 1/4" Standard Insulation- 5/8"
Recommended for diameters over 22" and for vertical applications. 2 Piece Construction — Ease of installation in difficult locations. Recommended for diameters larger than 15". Bent up flange — Available in any termination style and is only recommended for narrower designs. Holes and Cutouts — Allows for installation of thermocouples and transducers and give clearance for mounting bolts. Latch and Trunion — Spring loaded clamping is recommended for larger diameter band and in applications where the heater is mounted horizontally. Armor cable with fiberglass leads — Specify location and length of leads at time of order. Right angle armor cable with fiberglass leads — Specify location and length of leads at time of order. Metal braid with fiberglass leads — Specify location and length of leads at time of order. Shell Overlap — The metal strap is continued over the gap and a hole is provided. This allows for thermocouple mounting without a hole in the heater. 10-32 Threaded Terminals — Minimum width required 7/8". European Plug — Also available in 90 degree construction- Specify location at time of order. A thermocouple is a sensor for measuring temperature. It consists of two dissimilar metals, joined together at one end. When the junction of the two metals is heated or cooled a voltage is produced that can interpreted by a temperature controller, high limit or display device. There are two common constructions for these: Tube and Wire and Mineral Insulated. The tube and wire uses an empty stainless tube with a wire inside which has a welded tip incorporating the wire junction. This construction is typically used to 900?F. The Mineral Insulated construction uses a highly compacted stainless sheath with solid conductors encased in magnesium oxide insulation. This construction offers a wider variety of diameters, allows for the sensors to be bent in the field and for temperatures to 2200?F. These sensors are available is a huge range of physical packages with a variety of lead wire, housing, and mounting options. 2) Diameter (D) B=1/8", C=3/16", D=1/4"
Ring size A = #8, B = #10, C = 1/4"
2) Diameter (D) A = 1/16", B = 1/8", C = 3/16", D = 1/4"
A = 0, B = 1/8", D = 1/4", F = 3/8", H =1/2", J = 5/8", L = 3/4", N = 7/8"
A = 0, B = 1/8", D = 1/4", F = 3/8", H = 1/2", J = 5/8", L = 3/4", N = 7/8"
Contacts open on temperature rise. The ETR-9090 has been available for many years and is the workhorse of 1/16 DIN Microprocessor Based Controls. Using Smarter Logic technology, the ETR-9090 provides better than ever control results. SMT and microprocessor technology allows advanced features plus economy and reliability. All parameters are front panel configurable for easy set up. A ramp to set point function prevents rapid temperature changes that could damage the product being heated. The ramp function used with the dwell timer can provide two ramp and soak segments. The ETR-9090 in panel depth is only 3-3/8". 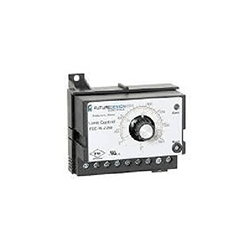 In use in a wide variety of industrial and commercial applications, the ETR- 9090 is the control to rely on. The ETR-9300 with Smarter Logic offers extensive features that are rarely available on a 1/16 DIN control. With universal input, all thermocouple, RTD, voltage and current types can be selected from the front panel. A universal power supply along with a low voltage input option provides a wide operating range. An analog input allows the set point to be remotely adjusted. When the current drops below a specified minimum, an alarm condition signals a heater failure. Should a sensor break, a smooth, bumpless transfer is produced from automatic to manual control to restrict a drastic, possibly damaging change in output. Programmable secondary outputs provide a wide range of variations. Proportional cooling, latching and band alarms are among the many possible functions of the secondary outputs. Remote networking of multiple controls is available with the serial communications feature. An analog signal retransmits the process value to a chart recorder, data logger or PLC. The ETR-9300's front panel is NEMA 4X/IP65 rated for harsh environments and for applications requiring washing with a direct spray. The panel depth is only 3". OGDEN offers the best value on the most advanced features. The ETR-3400 Smarter Logic microprocessor-based control features a bright four digit LED display. Control and input parameters are selected with three touch keys. A unique function places 5 parameters in the beginning of the menu. The menu then can be configured for a specific application. Either the process value or the set point can be displayed. Like the ETR-9300, when the current drops below a specified minimum, an alarm condition signals a heater failure. Should a sensor break, a smooth, bumpless transfer is produced from automatic to manual control to restrict a drastic, possibly damaging change in output. Programmable secondary outputs provide a wide range of variations. Controlling processes such as pressure and flow are possible because of the fast sampling rate. Digital communications or analog retransmission allow the ETR-3400 to be integrated with supervisory control systems and software, to drive remote displays, chart recorders or data- loggers. The panel depth is only 3-7/8". The ETR-3400 is a huge value in a very small package. ETR-3400-411111 Universal input, relay output 1, relay output 2/alarm 2, SSR alarm 1, RS-485 comm. CT-94-1 Current transformer, 50A max. 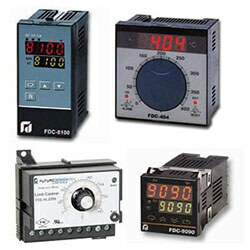 The ETR Fuzzy Logic plus PID microprocessor-based controller series incorporates two bright, easy-to-read, 4-digit LED displays, indicating process value and set point value. The Fuzzy Logic technology enables a process to reach a predetermined set-point in the shortest possible time, with minimum overshoot during power up or external load disturbance. ETR-9100 is a 1/16 DIN size panel mount controller. ETR-8100 is a 1/8 DIN size panel mount controller, and ETR-4100 is a 1/4 DIN size panel mount controller. These units are powered by universal 90-250 VDC/VAC supply. Up to three outputs are available for control and alarm. The second output may be used as cooling control, or an alarm. Output selections are relay, triac, 5 V logic output, linear current, or linear voltage to drive an external device. There are six types of alarms, plus a dwell timer may be configured for the third output. The units provide universal input selection of RTD’s and thermocouple types J, K, T, E, B, R, S, N, L without modification of the unit. The input signal is digitized by using an 18-bit A to D converter. Its fast sampling rate enables the unit to control fast processes. Digital communications RS-485 or RS-232 are available as an additional option. These options allow the units to be integrated with a supervisory control system and software. A programming port is available for automatic configuration, calibration and testing without the need to access the keys on front panel. By using proprietary Fuzzy Logic PID auto tuning technology, temperature overshoot and undershoot is minimized. Figure 1 control diagram is a comparison of a typical system response with and without Fuzzy technology. The ETR-404 features digital indication of the actual process temperature. The four- digit, 5/8" high display is easy to read. With the analog adjustment, the set point and the process temperature are simultaneously visible. Plug-in construction provides quick replacement of control modules for servicing or maintenance requirements. Only 2" in-panel depth is required. 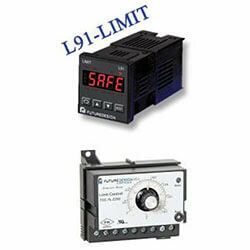 The ETR-3 is an FM approved safety limit control. Protection of expensive heaters and sensitive materials from damaging over temperature conditions is provided by the ETR-3. The DIN Rail Mounting feature allows quick installation without drilling or extra hardware. Exceptional performance will be provided by the ETR-3 in the most demanding situations. The ETR-9040 Limit Control protects equipment, materials and personnel from over-temperature process conditions. A true back-up system can be put in place when this control is used with a dedicated sensor and contactor. Universal Input allows the ETR-9040 to be used in many temperature, pressure, flow and other control applications. An optional port provides additional functions such as a programmable alarm, RS-485 communications, DC power supply, limit annunciator, or event input. The 18 bit A/D converter and 5 per second sample rate reacts quickly to protect fast changing processes. The large display can be set up to view the Process Value (PV), Set Point Value (SV), or SAFE. A main output Form C relay can be configured as a High Limit, Low Limit or High and Low Limit. The ETR-9040 should be protecting your process because it's easy to use, versatile and extremely accurate. Panel Mount or DIN Rail Mount - On-Off Limit Control with Latching Relay - Manual Reset - FM® Approved - Touch-Safe Terminals. 48mm x 48mm - Universal Input - Universal Power Supply - Remote or Local Reset - Selectable Control Range - Secondary Output - Event Input - Digital Communications - UL, CSA, and FM Approved. 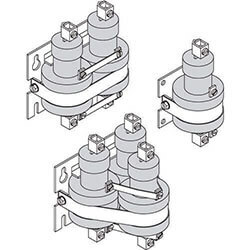 Mercury relays offer much faster switching than mechanical contactors, and though not as fast as solid state devices, are far more economical and can be mounted in a smaller foot print. Mercury relays are hermetically sealed with high quality glass to metal seals. The stainless steel tube is totally encapsulated in high grade UL approved epoxy to prevent moisture damage and voltage breakdown through the protective coating. The coils are wound on compact nylon bobbins and molded onto the metal tube to provide minimum power loss. This allows for low coil power required to actuate the contactor. This also enables the units to handle high loads with minimum de-rating due to higher ambient temperatures. Inert gases internally prevent excessive arcing between the mercury and the electrodes which enables the unit to function for millions of cycles with very low contact resistance, and minimum deterioration of the internal parts. Available in all standard coil voltages, in single, two and three pole arrangements: Other coil voltages available upon request. In multiple pole units each tube is actuated by its own coil. This eliminates pull-in variation between contact tubes, assuring consistent switching. 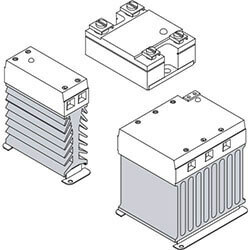 Please contact us for items with non-standard amperages or coil voltages. Many configurations available. Solid State Relays offer extremely fast switching and are ideal for all sorts of heating applications. With a variety of coil options, amperages, and mounting packages, SSR's are extremely versatile and allow for the tightest control possible. When properly used, a Solid State Relay (SSR) provides a high degree of reliability, long life and reduced electromagnetic interference (EMI), together with fast response and high vibration resistance, as compared to an electromechanical relay (EMR). An SSR offers all the inherent advantages of solid state circuitry, including consistency of operation and a typically longer usable lifetime. This is possible because the SSR has no moving parts to wear out or arcing contacts to deteriorate, which are primary causes of failure of an electromechanical relay. When properly applied, an SSR will have a normal life expectancy of many millions of operations, 10-1000 times more than most electro-mechanical relays. SSRs also have environmental advantages compared to mercury contactors. We offer a variety of custom packaged power handling controllers with a variety of inputs, and features such as soft start, voltage clamping, full diagnostics up to 1200 amps. These are fully fused and CSA and UL approved. Please contact us with your requirements. All units available With 4-20 mA coils. Smart Design Units with integrated fusing, fault & fuse indicators available for some units. Custom sizes and configurations available. Please contact us with your application requirements. © Copyright 2019. ASB Heating Elements Ltd.